The ideas and recommendation of products on this website are only for our own use and have not been endorsed by any feline nutritionist. We compiled these products through our own research and it is what we feed our own cats. Dibo Salmon Oil is a great supplementary food for cats and dogs. It is rich in essential, polyunsaturated omega 3 and omega 6 fatty acids. Omega 3 fatty acids play an important role in the body's physiological processes and support the development and functionality of various organs. It is especially important for healthy joints, heart and circulation as well as helping to improve the immune system, skin and fur. Salmon oil can also be beneficial if your pet is suffering from skin issues, heart problems and infections and it can also help wounds to heal as well helping to relieve any symptoms if your cat or dog suffers from allergies.A normal diet does not always provide enough omega 3 & 6 fatty acids. Especially pets on a BARF diet can benefit from Dibo Salmon Oil. The oil is gently cold pressed to help retain the valuable fatty acids. It is 100% natural, made without artificial additives. Dibo Salmon Oil comes in a handy pump action bottle for easy dosage. Cats are true carnivores (pure meat-eaters) and have very specific dietary requirements. Their natural diet consists of all sorts of prey like birds, insects, mice and other small mammals, which provide them with protein, fat, amino acids, vitamins, minerals and trace elements. A food containing raw or cooked meat is the closest thing to this natural diet in the wild. Not all the nutrients cats need to live are kept in meat from butchers and supermarkets. Feeding raw meat therefore requires supplementation of vital minerals and vitamins to prevent dietary deficiencies; Felini Complete is a balanced dietary supplement and turns pure meat into a all-round balanced meal. Felini Complete is free from vitamin K3 and contains no allergens making this meal perfectly designed for pets with allergies. Vitamin A (800,000 IU/kg), vitamin D3 (20,000 IU/kg), vitamin E [a-tocopherol acetate] (5500 mg/kg), vitamin B1 (320 mg/kg), vitamin B2 (160 mg/kg), vitamin B6 (240 mg/kg), vitamin B12 (1650 µg/kg), pantothenic acid (720 mg/kg), biotin (10,000 µg/kg), nicotinamide (1300 mg/kg), folic acid (52 mg/kg), iron [sulphate] (2400 mg/kg), copper [sulphate] (160 mg/kg), manganese [sulphate] (224 mg/kg), zinc [sulphate] (900 mg/kg), iodine [Ca-iodate] (42 mg/kg), taurine (100,000 mg/kg). This is classified as a food supplement due to its higher content of vitamins A, D3 and trace elements than complete foods. Only feed this as 5% of the daily feeding portions. Felini Complete is designed for the exclusive use in pure meat preparations and must not be mixed in as a supplement with complete foods (e.g. canned cat food). Application & Dosage:A supplementary cat feed. A fully grown cat weighing 4.5kg requires approx. 130g of meat spread out over 2-3 meals. Mix 65g of meat in with 0.8g of Felini Complete (flat spoon) and 2 tbsp of water. For the preparation of larger amounts give 12.5g of Felini Complete with 1kg of meat. As well as muscle meat, heart (up to 15%), stomach and kidneys (up to 5%) can be fed to your cat. 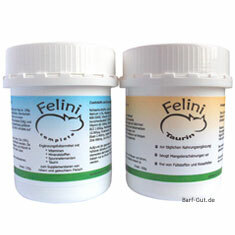 As Felini Complete contains calcium, phosphorous and vitamin A, you should not feed your cat bones or liver. Do not feed any raw pork. Felini Complete contains sufficient taurine. It supplements pure meat to achieve a balanced meal. No other supplements are necessary. For the formation of connective tissue and musculoskeletal system, your cat requires special nutrients. ​he/she require more of these nutrients than is normally found in traditional cat food. Megaflex provides your animal with these nutrients and revives normal tissue regeneration. Specially formulated with biologically enriched, cartilage-protecting substances that supply important nutrients necessary for the development and repair of cartilage. Glycosaminglycans (GAG), Chondroitin-4-Sulphate and Chondroitin-6-Sulfate, also further cartilage-protecting, all natural ingredients. contains natural substances that support the autochthonous regulation in cases of inflammation and pain. Has supportive, decongestant and soothing qualities. Humans use it to avoid joint degradation. counteract cartilage-decomposition and joint degradation with silica and other ingredients. supports the autochtone reparation processes of the connective tissue. The vegetable oils contained are rich with non-saturated Omega-3 and Omega-6-fatty acids. helps your cat absorb free radicals useful for treating deficiencies of the connective tissue, muscles, and joints. Meat & meat by-products, fish & fish by-products, dried mussel, vegetable by-products, yeast, vegetable oil, trace elements. Grau Bone Meal is the ideal calcium supplement for your cat because it contains natural minerals and trace elements and has really high bioavailability so that your cat can effectively reabsorb it. The nutrients contained in bone meal are vital for developing a strong skeleton and powerful jaw, and are particularly important for growth. Grau Bone Meal is suitable for cats and dogs. Grau Bone Meal can be used to supplement raw feeding (BARF) to correct an imbalanced calcium-phosphorous balance. Grau bone meal is also suitable for cats that don't tolerate bones well. Caution: Due to the high calcium content, medium-sized dogs only require 1 pinch of ground bone per day! Do not exceed this dosage. Note: Grau Bone Meal is exposed to high temperatures and enormous pressure during the cooking process. Heat and pressure kills all the germs so that cats and dogs are not infected with pathogens such as BSE and other diseases. No additives, according to the manufacturer. Cats: 1.5g every 2-4 days (depending on the calcium content of meat used and whole prey provided). A 0.5g measuring spoon is included in the packaging. Caution: Due to the high calcium content and bioavailablity of this product, please do not exceed the dosage stated above if giving to your cat. If your cat is fed exclusively meat or if you are feeding a BARF (Biologically Appropriate Raw Food) diet, your cat risks suffering from deficiencies in certain nutrients. Dibo Potato Flakes can help to prevent these deficiencies from occurring. Simply add these natural flakes to your cat's normal food to provide extra minerals and fibre. Potatoes are a rich source of magnesium and calcium, which can both help to boost your cat’s health and promote essential metabolic processes. The flakes are particularly easy to digest and grain free, which makes this suitable for cats with allergies. The gentle drum drying process prevents essential nutrients from being lost during processing. This product is has a high nutritional value: Approximately 1g of flakes gives all of the nutritional value of around 5g of fresh potatoes. Wholesome: 1g potato flakes represents approx. 5g fresh potatoes, and can help to prevent possible nutritional deficiencies that can result from feeding your cat a high meat diet. Gentle drum drying: essential nutrients are not lost during processing. Potato flakes (99%), calcium carbonate (1%). According to the manufacturer, this food contains no additives.